Photo credit: Fiona Gilligan. Protestors with art and murals. It is Monday, 6 June 2016. 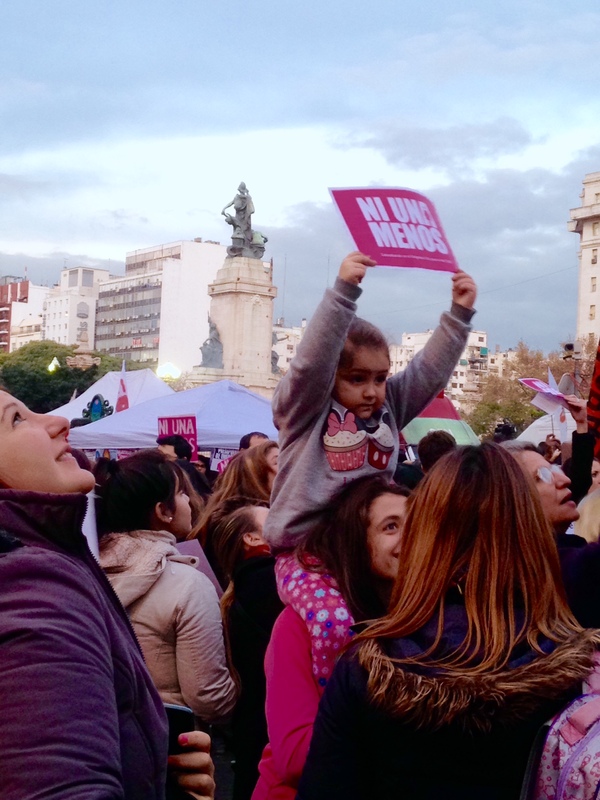 A year since the inaugural march, organizers of the mass social-media-born movement #NiUnaMenos renewed their call for action in response to the persistent and devastatingly high femicide rate in Argentina. A widely circulated statistic published by the NGO La Casa del Encuentro, reveals that a woman dies every thirty hours in Argentina due to gender violence. That is to say, women up and down the country are being killed every day for being women. Last year, a group of female journalists, united through Twitter, decided to take action. What started as an online debate between ten activists has since become a national priority. 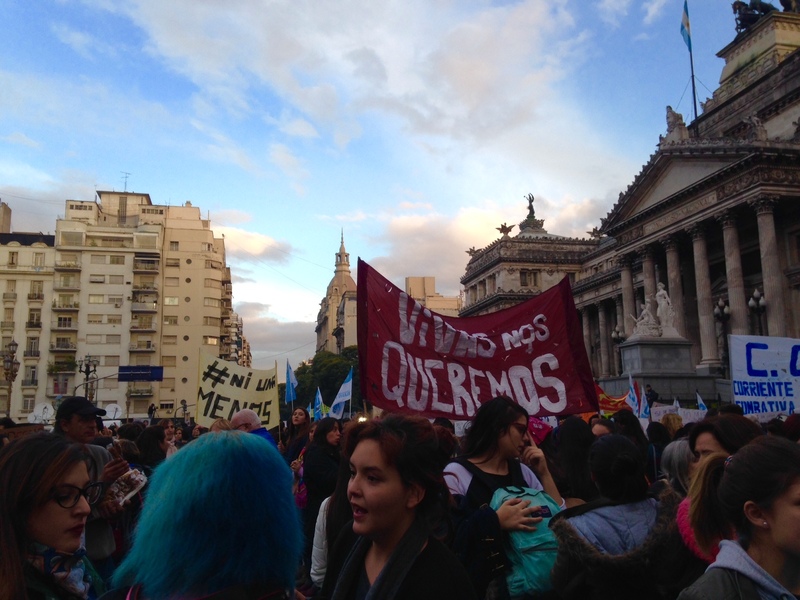 On 3 June 2015, people took to the street throughout Argentina to voice their concern about gender violence and staged what was one of the largest protests for women’s rights in Argentinian history. The main demonstration took place in Buenos Aires where some 300,000 people occupied the Plaza del Congreso in front of the national congress. Supporters rallied around the hashtag #NiUnaMenos, and it is because of this huge social media base that the movement has gathered momentum and raised awareness around the globe. Photo Credit: Fiona Gilligan. 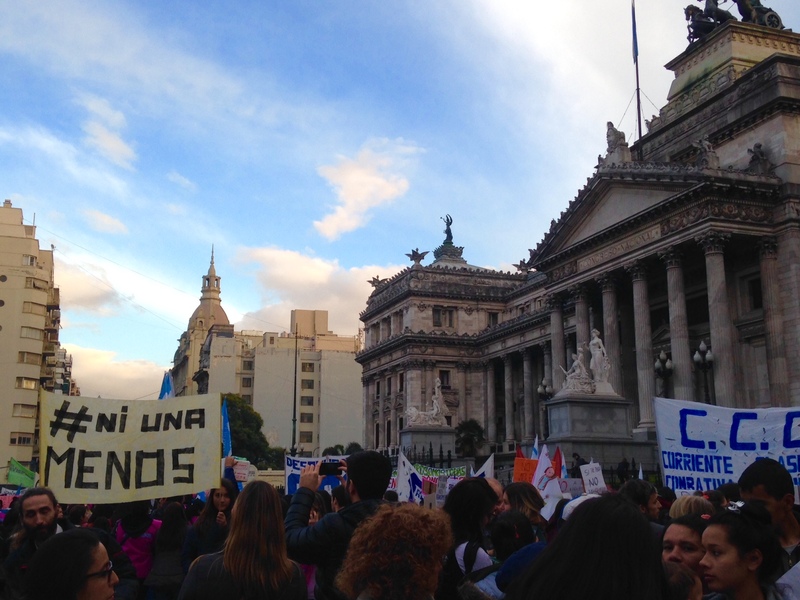 Protestors gather outside the Palace of the Argentine National Congress in the centre of Buenos Aires. In the year since the movement’s birth and inaugural march, Argentina has experienced a series of changes following the change of government. 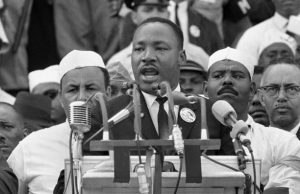 Movement organizers perceive these changes as potentially detrimental to the progress of the movement and its demands. 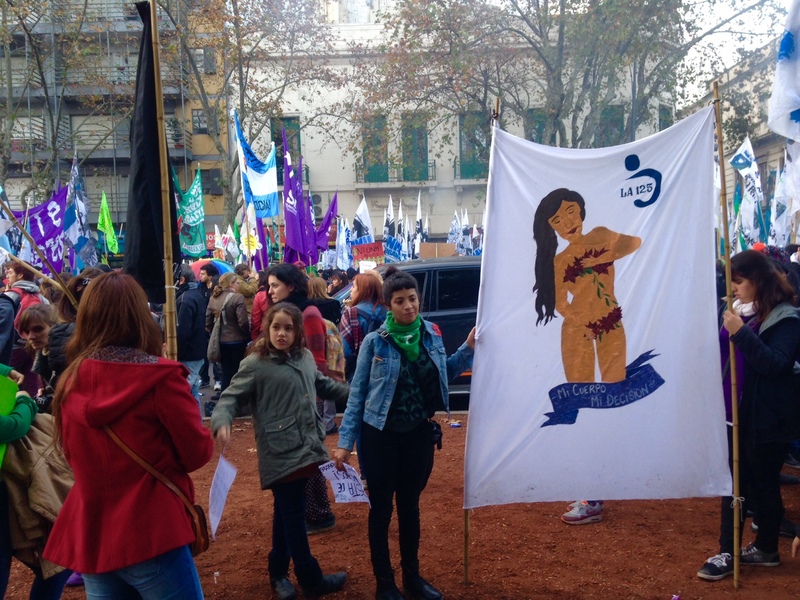 Activists are particularly concerned about the impact that the new spending cuts adopted by new president Mauricio Macri will have on the lives of women. Biased state policies mean that women are one of the most vulnerable sectors of society, and thus bear the brunt of such austerity, budget cuts, and economic adjustments. This makes real social change and transformation impossible for thousands of women. Therefore, on the one year anniversary of the mass demonstration, organizers renewed their call to action. Once again, the call was met with mass support from all sectors of society. Although it was the issue of femicide in particular that gave impetus to the movement, #NiUnaMenos also advocates against all forms of gender violence, including human trafficking and kidnapping. This year’s protest also took on deeper dimensions in the area of women’s rights, including the call to legalize abortion. In particular, the movement demanded the urgent liberation of a woman known simply as “Belén” to the Argentine population. The twenty-seven year-old from the Tucumán province was convicted of homicide and jailed for eight years after suffering a miscarriage. These various manifestations of gender crimes express gross persisting inequality and confirm the worrying fact that machismo is still a deeply engrained notion in Argentine society, as patriarchy is throughout the world. Photo Credit: Fiona Gilligan. Vivas nos queremos . Although the movement is calling for the implementation of more comprehensive measures and legislation in order to put an end to such hate crimes, it is also calling for something far deeper. The frequency with which stories of gender violence and femicide surface show that this is more than just a judicial problem. Gender inequality and the maltreatment of women is something that has become naturalized in Argentine society. It is a cultural issue. The notion that women are mere sexualized objects, rather than autonomous beings is gender violence in itself. On 3 June 2016, the #NiUnaMenos movement returned to the streets to remind Argentina of its joint responsibility to rectify this gross injustice, and to demand the equal respect of the lives of women. This is not an honor or a virtue; it is a basic human right. The #NiUnaMenos movement not only renewed their plea to the Argentine government to take action, but also to the rest of the world to support this collective cry against persisting machismo and gender violence. The issue of femicide is not confined to Argentina, nor Latin America at large; it is a serious issue worldwide, but it is not sufficiently discussed in society nor in the media. The absolute lack of coverage on the recent #NiUnaMenos march and its impetus by the English speaking media highlights the extent to which gender violence throughout the world is silenced. It is assumed that issues affecting women in other continents are irrelevant and insignificant to us. But this is simply not true. The hardship faced by women throughout the world is all interconnected. Photo Credit: Fiona Gilligan. Protestors of all ages took to the streets. The more informed we are about worldwide feminist issues such as femicide, the more we can build solidarity and work together to push through the boundaries restricting women and create real, positive change. However, we need to not only hear the cry of all women throughout the world, but also listen to what they are saying and act in solidarity with them. We cannot assume that we know what is best for them. Patriarchal society ignores the wants and needs of women, so as western-feminists we need to ensure that we do not unintentionally perpetrate this injustice. 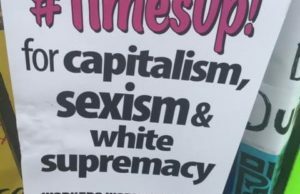 Instead, it is important to acknowledge our position of privilege – because yes, as western women we hold various degrees of privilege – and use it to raise further awareness. It is important that “we” in the west listen to, and uphold, women’s desires and demands around the world, particularly when the media and other patriarchal avenues are shutting them down. 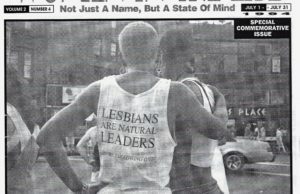 Freedom of speech allows us to not only voice our own feminist motives and issues, but also engage and connect with those of women elsewhere. In the twentieth century we are lucky enough to be armed with an array of platforms on which to make ourselves heard. The internet and social media have diminished previously insurmountable distances, facilitating comradeship and an international support network for such matters. Modern technology has arguably democratized modern feminist activism, with the hashtag, as used by the #NiUnaMenos movement, becoming an activist’s most powerful weapon and a catalyst for real change. The resurgence of similar feminist movements in other South American countries in response to the Argentine movement – namely in Peru and Venezuela – also demanding an end to femicide, highlights the sheer power of the media and its ability to incite mass mobilization. Photo Credit: Fiona Gilligan. 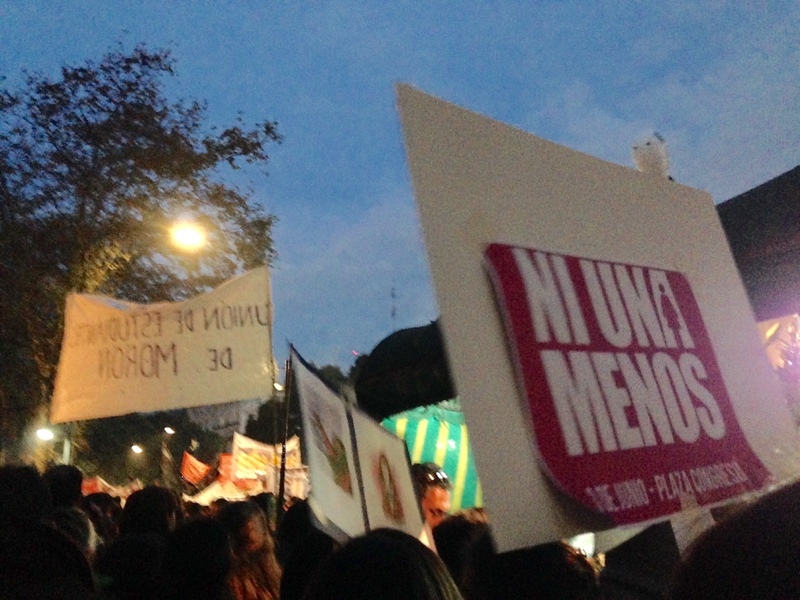 The recognizable #NiUnaMenos logo has become commonplace throughout the country. However, advances made in the wake of the first #NiUnaMenos march in 2015 remain overshadowed by the amount of work still to be done to eradicate gender violence here in Argentina, further afield in South America, and throughout the world in general. The devastatingly high femicide rate that exists here in Argentina is a manifestation of the persistent patriarchy and whiteness of global relations. These are worryingly detrimental characteristics of all our cultures that need to be urgently addressed. What I learned from my experience at the 6 June 2016 #NiUnaMenos protest is that South American women will not be silenced on the matter, and neither should the rest of the world. 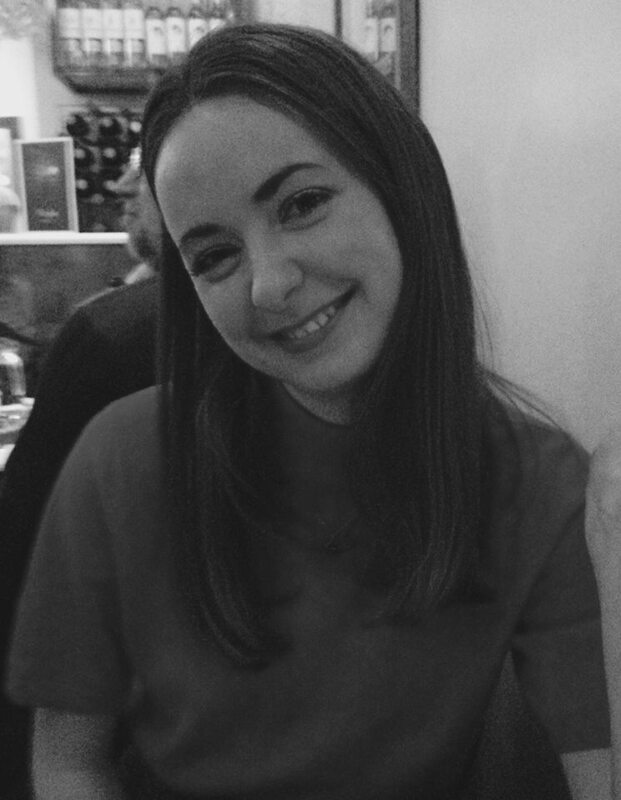 Fiona Gilligan is a student of Spanish and Philosophy at the University of Bristol in the UK. She currently lives in Buenos Aires, working for a local women’s foundation called Mediapila that strives to empower and mobilize women through training in sewing and textiles.